The Thysuis lute book, keyboard music from Renaissance Poland, and guitar works of Francesco Corbetta. I. Adriaan Joriszoon Smout (1578/9-1646): Thysius Lute Book. (Pacoloni Ensemble). Brilliant Classics CD 95821. Adriaan Smout (1578-1646) was a philosopher, teacher and preacher who collected and transcribed the music that came his way from across Europe. He lived, worked and died in Rotterdam, a city that has always been well-placed to capitalize on international commercial and cultural links to support a distinguished history of music publishing. The contents of Smout's collection, which found its way into the Thysius library in Leiden, embraces musical forms amongst the most popular of the late-Renaissance and early-Baroque periods: songs, branles, galliards and allemandes. There is also a bergamasque (a shepherd's song) which, in its extreme simplicity, has been taken by the Italian musicians of the Pacoloni Ensemble as an opportunity for improvisation and variation. The original authors have nearly all been lost in the mists of time, except for Smout's transcription of ´Can she excuse´, a song by John Dowland. Up to four lutes are used, and several tracks are enhanced by percussion which would have lent color and rhythmic strength to this music played in its own time: the manuscript as a whole has been freshly edited, and taken as the basis for richly textured and melodically elaborated performances which do not confine themselves to the literal indications of the tablature. Led by their founder-director Roberto Cascio, the musicians of the Pacoloni Ensemble have been performing together for two decades. They are all members of other early-music ensembles who come together to explore the treasure-trove of little-known repertoire written during the golden age of the lute. The world-premiere recording of an early 17th-century collection of music conceived for a richly varied ensemble of lutes. Adriaan Smout (1578-1646) was a philosopher, teacher and preacher who collected and transcribed the music that came his way from across Europe. He lived, worked and died in Rotterdam, a city that has always been well-placed to capitalise on international commercial and cultural links to support a distinguished history of music publishing. The contents of Smout’s collection, which found its way into the Thysius library in Leiden, embraces musical forms amongst the most popular of the late-Renaissance and early-Baroque periods: songs, branles, galliards and allemandes. There is also a bergamasque (a shepherd’s song) which, in its extreme simplicity, has been taken by the Italian musicians of the Pacoloni Ensemble as an opportunity for improvisation and variation. The original authors have nearly all been lost in the mists of time, except for Smout’s transcription of ´Can she excuse´, a song by John Dowland. Up to four lutes are used, and several tracks are enhanced by percussion which would have lent colour and rhythmic strength to this music played in its own time: the manuscript as a whole has been freshly edited, and taken as the basis for richly textured and melodically elaborated performances which do not confine themselves to the literal indications of the tablature. Led by their founder-director Roberto Cascio, the musicians of the Pacoloni Ensemble have been performing together for two decades. They are all members of other early-music ensembles who come together to explore the treasure-trove of little-known repertoire written during the golden age of the lute. The Thysius Lute Book is one of the most important and substantial collections of lute music from the 16th and 17th century. The collector was Adriaan Joriszoon Smout, Dutch philosopher, teacher and preacher, who brought together a staggering amount of 900 compositions in 522 folios. The music in the collection is a reflection of the musical taste of the day, which was a melting pot of styles from all over Europe, and gives us a glimpse of what domestic music making was in the Golden Age. The works are for a variety of instruments, and the present recording offers works for 1, 2, 3 and even 4 lutes. The forms are mainly dances, composed on a basso ostinato, as well as instrumental versions of popular songs. The Pacoloni Ensemble is an Italian group specialized in the research and performance of music for the lute, whether solo or in ensemble. The excellent liner notes are offered in both English and Italian. II. Johannes de Lublin tablature (1540). (Corina Marti, Renaissance harpsichord). Brilliant Classics CD 95556. The 1540 manuscript “Tablature of Jan de Lublin” is the largest collection of keyboard music of 16 century Europe. Its 260 paper folios contains more than 230 compositions, two theoretical treatises and over 250 music examples with a didactic purpose. It is notated in the “older” German organ tablature notation, a combination of music notes and letters. The richness of the repertory is impressive, both in terms of musical genres and composers represented as well as the instrumental techniques employed. We find works of Polish, German, Italian and French origin, varying from Polish folk dances to tablatures of vocal works by Josquin, Brumel, de Sermisy, Walter and others. Corina Marti, plays an historical Renaissance harpsichord. She is a specialist in Early Music and a professor at the prestigious Schola Cantorum Basiliensis in Basel. This unique recording was made possible with the support of the Adam Mickiewicz Institute in Poland. From Stephen Midgley: The Tablature of Johannes (or Jan) of Lublin, its manuscript preserved in Kraków, is the largest collection of renaissance keyboard music in Europe. It contains a wide variety of secular and sacred music, ranging from straightforward instrumental formats such as Preambulum or Corea (dance), to intabulations of chansons and sacred polyphonic works by the likes of Josquin, Senfl, Sermisy, Brumel and Ribera. The selection of 39 pieces offered here is arranged in five sequences, each consisting of a well-organised variety of formats. They offer an enjoyable mix of lively, cheerful and reflective pieces, with a few melodies that will be familiar to renaissance enthusiasts. Polish music is fairly represented, generally characterised by lively and enjoyable melodies, but the selection as a whole has a strong international flavour. The merits of the music itself are further enhanced by the extremely stylish and spirited playing of Polish harpsichordist Corina Marti, who captures these diverse renaissance styles to perfection – and, secondly, by her fine instrument, a modern copy by Volker Platte after an anonymous Neapolitan instrument from around 1520. The instrument sounds remarkably beefy by renaissance keyboard standards, and its sounds are well captured by a vivid recording in a pleasant ambience. Booklet essay by Pawel Gancarczyk, in a faultless English translation, is both wide-ranging and detailed, and altogether extremely informative. This recording, sponsored by the Adam Mickiewicz Institute named after the eponymous 19th-century Polish poet, is an enterprising and beautifully executed project. It can be strongly recommended to fans of keyboard and other early music. III. 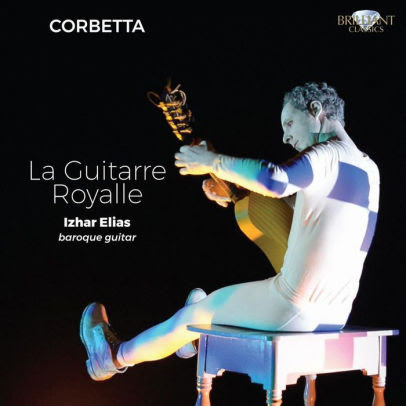 La Guitarre Royalle (Izhar Elias, baroque guitar). Brilliant Classics CD 95587. On this album Elias has made his own selection from two of Corbetta’s published volumes which were written for King Charles II (1671) and King Louis XIV (1674) respectively. According to him, Corbetta’s music is rooted in the popular songs and dances of his day, making him more like a modern pop songwriter. Using the genres of chaconne and passacaglia, several of which are included here, he transformed the guitar into a polyphonic instrument and a genuinely soloistic one compared to its previous, humble role as an accompaniment to song and strings. There are also two substantial dance suites, in A minor and G minor. The high range, frequent resolution of dissonance, virtuosic techniques, and coloristic effects, such as overlapping tones of campanelas or flashy repicco strumming, converged in his guitar music to make it the most brilliant if challenging of the era.